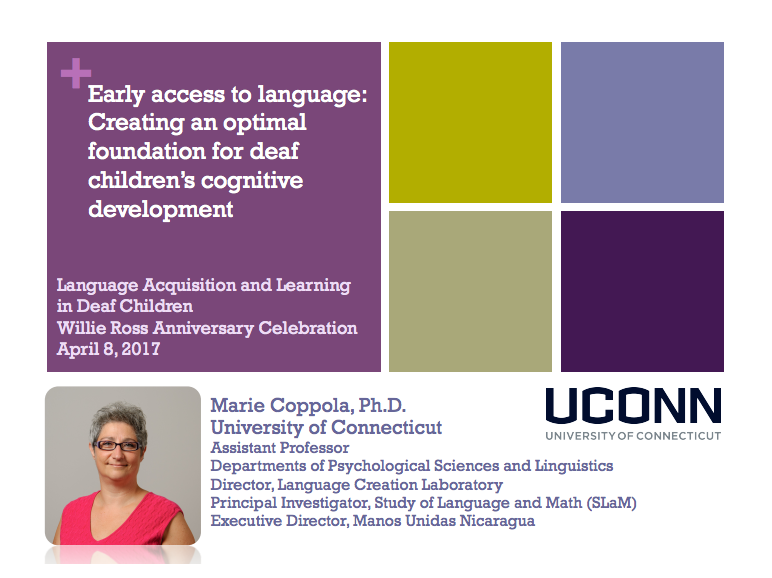 On April 8th, Lab Director Dr. Marie Coppola gave a talk at the Language Acquisition and Learning in Deaf Children Conference. Take a look at her presentation, “Early access to language: Creating an optimal foundation for deaf children’s cognitive development,” here. 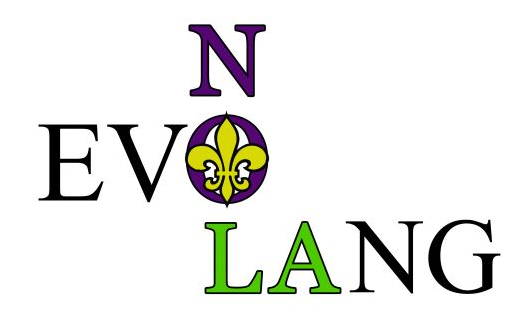 The presentation covers the importance of accessible language for both Deaf and hearing children, the benefits of bimodality and bilingualism, the functional neuroanatomy of language, and the intersection of language with other domains and aspects of cognitive development like math. Hosted by the Baystate Continuing Interprofessional Education and the Willie Ross School for the Deaf, the Language Acquisition and Learning in Deaf Children Conference focused on the language acquisition, education, and development of Deaf and hard-of-hearing children. The article, “RIT/NTID program encourages students to pursue doctoral degrees” by Vienna McGrain, can be read here. Graduate student Russell Richie’s prelim paper accepted into The Mental Lexicon journal! Russell’s paper, titled “Functionalism in the lexicon: Where is it, and how did it get there?”, initially written as one of his prelims, has been accepted into a thematic issue titled “New Questions for the Next Decade”, and will also be published in a book with other articles and commentaries. Many thanks to Marie and other faculty who helped the paper along! Two of the Language Creation Lab’s undergraduate research assistants, Rachael McCollum and Therese O’Neill, have been awarded the PCLB Psychological Sciences Undergraduate Research Grant. Rachael’s project is titled “The impact of language experience on the development of the number representations in deaf, hard of hearing, and hearing children”, and Therese’s project is titled “Investigating social perspective-taking in effective communication and language regularization.” Both projects will be advised by Dr. Marie Coppola. The grant will provide funding for Rachael and Therese to complete their projects in the upcoming year. The article is titled “The Case for Bilingual Deaf Children” and can be read here. Congratulations to Graduate Student Jessica Contreras for Earning her Master of Science in Experimental Psychology at RIT! 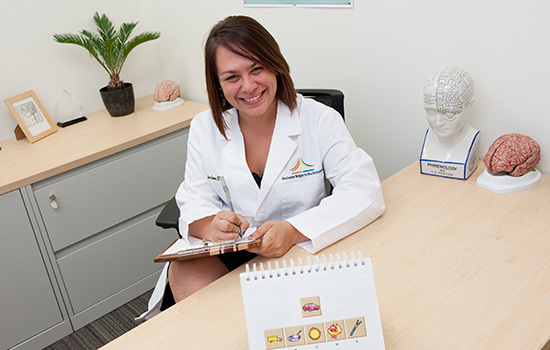 Jessica Contreras, a Developmental Psychology PhD student and member of the Language Creation Lab, recently completed her Master of Science degree in Experimental Psychology from Rochester Institute of Technology. Her thesis investigated the relationship between language and cognition for Deaf individuals with cochlear implants, focusing on factors such as executive function, proficiency in English, proficiency in ASL, age of cochlear implant, age of exposure to ASL, and socioeconomic status. Congratulations Jessica! Congratulations to Russell Richie, Matt Hall, Sarah Lodge, Megan Brown, and Dr. Marie Coppola, whose research was named as one of two runners-up for best poster at the 2016 EvoLang conference! Entitled, “The impact of communicative network structure on the conventionalization of referring expressions in gesture,” this project asks how people come to agree on what to call things. Their behavioral experiment demonstrated that groups of people reach agreement faster when all possible pairs communicate compared to when all communication is channeled through one central hub. The work was funded by an IGERT Innovation award to Russell Richie. You can read their paper here! Congratulations to Language Creation Lab graduate student Emily Carrigan for receiving a commendation from the Provost for Teaching Excellence!